Bead Up -- the journey of handmade jewelry: 200 custom made-to-order necklaces in 5 days! 200 custom made-to-order necklaces in 5 days! It goes without saying that, by the looks of my blog, I have been quite MIA. Ask my craft room and new home in Kansas city if I have been MIA and they would give you a quite different answer! 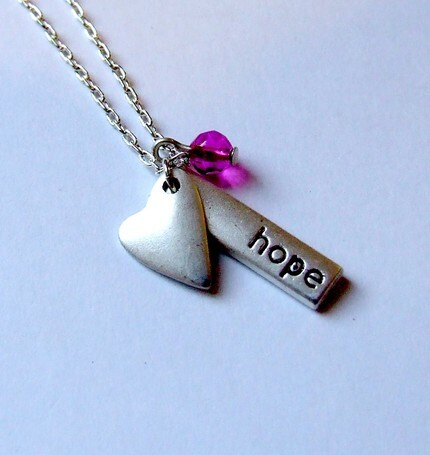 A few days before my husband and I packed up the car to move from Los Angeles to Kansas City, I got an e-mail from someone on Etsy asking if I could create 30 copies of my "Hope" necklace for a graduation her institution was hosting. Wow - 30! That was perhaps my largest order to date! Though I knew I wouldn't be able to make 30 of the exact same necklace, I searched around a found some comparable components and offered a wholesale price to the buyer. 30 soon turned into 50, and not only that, but the buyer wanted to substitute the pink bead for a purple trumpet bead. After adding trumpet beads to my to-buy list for the project, the buyer asked that we up the number of necklaces again to 100! WOWZA! I frantically tried to find the chain and charms that I needed, and as I was on the road to my new home, the buyer asked for 200 necklaces! HOLY JUNK! Sign me up - I think?! So in addition to trying to move into my new home and prepare for a return trip to LA for the husband's ordination, I searched far and wide for the materials I needed to make these bad boys. In the past when I have made custom jewelry I have had little problem finding the amount of components I need. That was before I was looking for 200-800 of certain pieces. When I went to order 200 of the HOPE charms from one of my favorite sites, FusionBeads, turns out they only had 14 in stock. Ooooh. Next, when I went to order the heart charms I had offered to include on the necklaces, Artbeads only had 25 in stock. Hmmm. Next when I went to Michael's to buy 50 (yes, 50) packets of chain, they of course only had 3. So what's a girl to do? Whine to her husband and have him help! While I searched frantically online for other distributors of the Hope charms, the hubs called EVERY Michael's store in 3 counties and 2 states in and around Kansas City to see who had them in stock. I then spent a whole day driving around my new city and visited 5 Michael's stores within 3 hours - whew. Thankfully I found the bulk of what I needed, though had to settle on a few packets of chains in a slightly different style. AND my VistaPrint order of new business cards was not going to arrive before I needed them because, oh, did I mention that the buyer needed these all within 5 days? The factory worker in me got to work with whatever I had in stock as I waited for the supplies I ordered online arrived. I first cut 200 18" strands from 50 packets of 4' chain and attached them each to spring rings from Artbeads (click on the link to read my review of the product). And finally, the day before I needed to mail the finished products (and the day before I was to fly back to California), the heart beads I ordered from Etsy seller CLBeads in Canada arrived - whew! That was close! The buyer wanted 160 of the necklaces partially packaged so she could easily put them around the necks of the graduates at the ceremony. The hubs painstakingly punched, prepared, taped, and packaged each kit while I finished the necklaces until 2am that night. That's love, I guess! We rushed to the nearest Post Office (I had to google map it since I had yet to search out my local post office!) to mail the finished box of necklaces off to the buyer in Colorado. While in LA, I was thrilled to get an e-mail from her stating that she not only received them in time, but also loved them. Whew! I can sleep now! So, there you have it folks - how Bead Up (and her husband!) made 200 necklaces in less than 5 days. Hope to do it again soon - no lyin! I so envy you! A wholesale order! Congrats! You did an awesome job. I'm speachless! This is wonderful! Get some rest! I am also speechless that was a job and a half congratulations on both completing and moving how on earth did you saty calm! no don't answer that. Enjoy the weekend you deserve it. Beautiful necklaces btw. Holy cow! You are one dedicated crafter! found you on etsy forums, i hope you'll come visit me too! Wow-fast work! Almost everything I make takes a long time--wholesale would kill me. That's fantastic! I can see why you have so many orders - your designs are beautiful! I'm sending an award your way! I exist - I promise!